Choral Arts Alliance of Missouri’s newest extension, Prometheus joins as the organization’s permanent professional Artists-in-Residence. 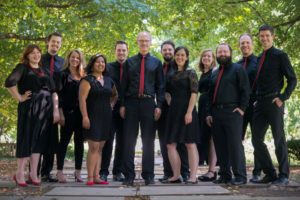 Under the direction of Artistic Director R. Paul Crabb and Assistant Director Emily Edgington Andrews, Prometheus’ ten singers hail from regions across the United States. Each of them leading professional lives as soloists and chamber musicians, their collected experience brings a special breadth and depth to the ensemble, lending Prometheus a unique versatility and intimacy. The ensemble will join CAAM once a year to lead masterclasses and educational workshops, perform on tours, and to represent the organization as ambassadors nationally and internationally of the artistic virtues for which CAAM is known: Excellence, Education, and Innovation.